A clerk serving Cantonese-speaking customers at a cluttered market in San Francisco’s Chinatown reached into a tub of American bullfrogs. She drew a one-pound frog from the top of the pile. She whacked its head, sliced its neck and placed its body in a plastic grocery bag. The frog cost about $4. If it was sautéed, stir-fried or cooked in a clay pot and served with rice and vegetables, it could provide enough poultry-flavored white meat for a meal for at least two people. Tests on the bullfrog by Raul Figueroa, a researcher at San Francisco State University, confirmed that it was infected with an invisible but virulent fungus. The chytrid skin fungus Batrachochytrium dendrobatidis, or B.d., is harmless to humans but may have wiped out hundreds of amphibian species. Two other bullfrogs that The Bay Citizen bought from other Chinatown markets also tested positive. The disease appears to affect only amphibians, and some species are immune to its effects while others succumb rapidly. It causes the amphibians’ skin to thicken and leads to cardiac arrest. American bullfrogs are native to eastern North America but are reared in factory farms around the world. 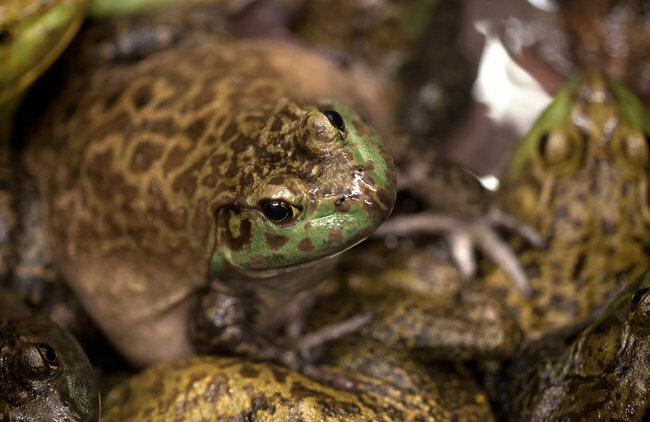 Two million bullfrogs are imported into the Bay Area every year, according to federal import records, and millions more are shipped to other major cities. Scientists and conservationists fear that the global trade could lead to the extinction of countless species of frogs and salamanders. Amphibians play subtle but substantial roles in California’s ecosystem, eating insects and feeding wildlife. American bullfrogs are an invasive species in California. State law requires markets to kill the bullfrogs when they are sold, although pet stores are allowed to sell them alive. Yet the bullfrogs make their way into rivers and lakes, where they spread the disease and devour everything from native tadpoles to ducklings. Some of the bullfrogs that are free in the Bay Area are former pets. Buddhists may have released others during traditional ceremonies that liberate living creatures. Once in the environment, the frogs can reproduce. Efforts to ban the live bullfrog imports have been strenuously opposed by Chinese-American leaders who defend their communities’ rights to a traditional part of their diet. A study of 493 fresh-bought frogs from San Francisco, Los Angeles and New York found that 62 percent were infected with the chytrid fungus. American bullfrogs survive the pathogen but can transfer the fungus spores to other, less fortunate species. The fungus has torn through the Sierra Nevada, leaving the once-abundant mountain yellow-legged frogs on the brink of extinction. every year carry the chytrid skin fungus. Proposals to ban the live imports into California were initially pushed forward by conservationists and animal rights groups in the mid-1990s. A few years later, scientists perplexed by worldwide amphibian deaths discovered B.d. Assemblyman Paul Fong, Democrat of Cupertino, who championed a bill last year that outlawed the sale of shark fins, opposes a ban on live frog imports. So does Senator Leland Yee, Democrat of San Francisco. “It’s a food stock that many Chinese-Americans rely on,” Mr. Yee said. Pius Lee, chairman of the Chinatown Neighborhood Association in San Francisco, said he warned Buddhists that “pro-animal groups are watching you” and suggested they free animals from containers without releasing them into the wild. But Kerry Kriger, an ecologist who founded the Santa Cruz-based nonprofit Save the Frogs after studying B.d. in Australia, said regulations were needed.